Info on how Northfield compares to some other cities in terms of levies and aid cuts. Details about a joint public-private partnership for yet another “community video” for Northfield, to be used… how? where? why? to what end? I dunno, but let’s throw some money at it because it seemed like a good idea at the time, and apparently there’s no one on City staff who remembers the dismal result the last time the City tried something like this without more of a plan. Updates on the Fourth Street improvement/infrastructure project. Update and disclaimer from the IT department regarding the City_of_Nfld_PR account on Twitter. News from the library about the summer reading program. You can find the Friday Memo on the memo page for the week. The schedule is a bit off this week since Monday is a holiday. There is a City Council meeting on Tuesday, and a Planning Commission work session on Wednesday (moved up from Thursday because the Commission is finalizing information for the Council meeting packet for the June 8 meeting and staff needed the extra day for prep). There is a City Council work session (including a joint session with the Planning Commission to discuss the next installment of the draft Land Development Code) this week. You can view all upcoming City meetings on the City Calendar. 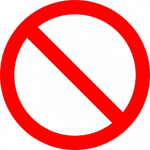 If you read this post, and/or click on any of the links within, would you do me the favor of a comment below just letting me know that you did so? As I posted last week, I’m still undecided about how valuable these weekly posts are, and how many people read them. Thank you! Does anybody read the Friday Memo on LoGroNo? I’ve been doing weekly recaps of City Administrator Joel Walinkski’s Friday memo for forever. Actually it was Griff who started it. We wanted to disseminate the information in the Friday Memo (a PDF link posted on the City website), highlighting items of note with the ability to link to other documents and materials. 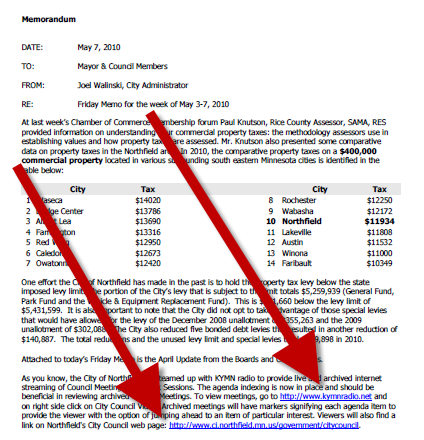 Eventually the Northfield News and others began posting links to the Friday Memo, and recently the City started including hyperlinks in the memo PDF itself. I’m wondering if Griff’s original idea has now outlived its usefulness. Since there are rarely any comments on the Friday Memo posts, I’m not sure we’re doing much of a service; not enough, that is, to justify the hassle factor (for me). So I’d like to know, if I discontinue doing the Friday Memo posts, does anyone care? I haven’t done the last two, and the only person I’ve heard from about it is Griff. 🙂 I’m happy to continue if our commentary is an added value, but if not, the information is available multiple places now. I’d like to know what you think. Kudos to the City of Northfield for now using links in the weekly Friday Memo. See yesterday’s as an example. There’s a City Council strategic planning session tonight (sorry, no details available other than place and time) and a City Council meeting (including the 4th Street trees issue) tomorrow. This week’s memo contains musings and updates about unfunded mandates, as well as details about the construction closure of the Fifth Street bridge for a little more than a week. You can find the Friday Memo on the memo page for the week. No City Council meeting this week; see the City Calendar for schedule and details of other meetings. This week’s memo contains the scoring and ranking of proposals by the Safety Center Architectural Firm Selection Workgroup. The top 5 firms are tentatively scheduled for interviews next Friday, March 26. In addition, from now on the mid-month Friday Memo will include a draft of City Council agenda items for the upcoming month. (April’s draft agenda is included in this week’s memo.) You can find the Friday Memo on the memo page for the week.